Escape to an enchanting desert oasis in Paradise Valley at the Embassy Suites at StoneCreek where the comfort of our guest room accommodations and exceptional location join to produce and outstanding golf resort experience. 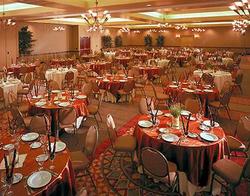 This resort is the perfect venue for class reunions wanting to put on a multi-day affair. Friday afternoon golf Tournament followed by a cocktail reception at the Golf Club. Saturday Evening Banquet featuring a gourmet selection of Steak, Chicken, or fish entrees with all the tasty sides to accompany the main dish. And Family Picnic Sunday at the park nearby with pizza, subs, chips, soft drinks, and games for young and old. Classmates can choose from one of the following entrées: London Broil - meat grilled to perfection, starch, vegetable, rolls, dinner salad, and dessert; or, Honey Sesame chicken - Chicken - baked chicken breast, starch, vegetable, rolls, dinner salad, and dessert; or, Salmon - pan seared salmon, starch, vegetable, rolls, dinner salad, and dessert. . Beautifully Appointed Suites with Cooked-to-Order Breakfast included.